Looking for a Snake Catcher? Our List of Premier Snake Catchers Will Make it Easy. I’m sure we’ve all been watching television and seen the disclaimer “Don’t try this at home.” With snake capture and relocation, there are good reasons for that. This job is definitely best left to the professionals at Snake Catcher Brisbane. We can remove the uninvited guest quickly any time of the day or night and ensure safety for all parties involved – including the snake. Whether the snake is clearly venomous or not, you will still be happy you called Snake Catcher Brisbane. Our professional snake catchers in Brisbane have the experience to maximise the chance of snake capture when attending your premises, but they need your help. You have contacted Brisbane Snake Catchers but may not know what to do while waiting for your snake catcher to arrive. The first thing to remember is that snakes are generally more afraid of us than we are of them and will not attack unless provoked. 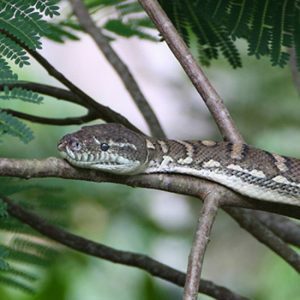 After moving all children and pets to safety, it is considered reasonable to keep an eye on the animal from a safe distance and even capture a photograph to help with Identification in case the snake disappears. It is well known that the majority of snakebites occur when an inexperienced person attempts a capture or worse still tries to kill the snake. Be sure that when engaging a Brisbane snake catcher you engage a long term, experienced handler like those from Brisbane snake catchers. You should feel confident that the capture and relocation are done by a government certified snake catcher who will ensure the best result to your circumstance. What sets apart our business from other Brisbane snake catchers? Experience and professionalism are two words that could be used to describe us. Our list of numerous experienced professionals keeps you from having to look at each person’s credentials separately- if we list them, you know that they are credentialed and insured as well as being highly experienced. You will not end up with a hobbyist or amateur and risk injury or unnecessary failure to resolve the problem. Our snake catchers in Brisbane understand the ecology of the snakes we are trying to manage which means that they are less likely to avoid capture on your premises and more likely to be humanely relocated after removal. If you still need more information to make your decision, please contact our consultants to learn more.